Looking for creative ways to produce live concert video content for your Volanti Displays? Go beyond just playing static images or stock footage during your shows. It starts with a couple of things: Resolution, Content Brightness and VJ Software. In this piece we will provide a brief overview of VJ software that is currently available on the market as well as discuss a few key things to keep in mind while choosing video content. While designing your live visual set it is important to keep in mind what your video content’s resolution is. Volanti Displays’ line of Video Walls and Display Modules have a standard 1920×1080 resolution while products like the Volanti Forza 84″ 4k and 65″ 4k modules have a 3840 x 2160 resolution. Thus making it important to choose video content that will best fit the display’s resolution parameters. Resolution count is based on the amount of given pixels within the display’s viewing plane. The amount of pixels make up a collection of tiny dots that form an overall image. 1920 x 1080 simply means there are 1920 pixels (dots) horizontally while there are 1080 pixels (dots) vertically. The more pixels, the sharper the display image will be, so a higher resolution will always produce a clearer, sharper, more detailed image on your display. 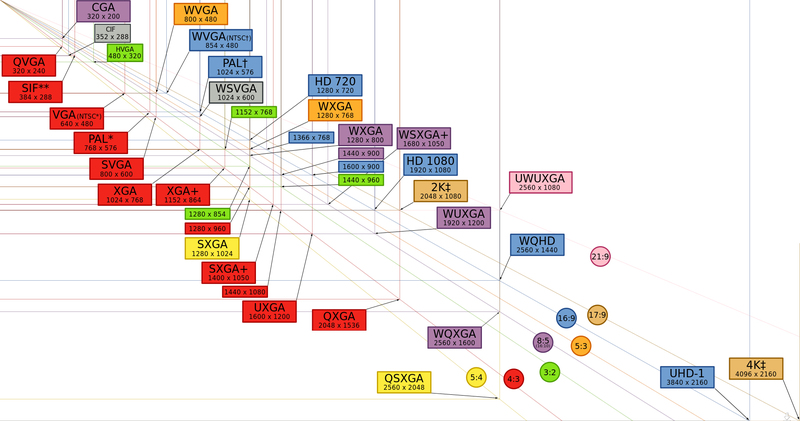 Below is a chart of resolutions and their pixel count. Whether you’re displaying on a single display or a video wall, it is important to monitor the content’s resolution. If you decide to buy licensed video content from a stock footage provider be sure that the content is 1920 x 1080 or higher. Standard definition 640 × 480 pixels will look very pixelated and blurry which could in-turn lower the production value of your live performance. A quick google search for stock footage or video content will provide you with a seemingly never ending tunnel of clips to choose from. These are often great ways to build up your collection of video clips that can be later effected using VJ Software which we will get into in the latter part of this piece. Note: Although you may stumble across some sites offering free clips, most are a ‘pay for license’ use. If you plan to construct your own video content using software such as After Effects, Maya or Trapcode Particular, be sure to set your composition resolution no lower than 1920 x 1080. Also, keep in mind that the brighter the content the more visual impact it will have, which brings us to our next topic: Brightness. Now that you have your resolution figured out, it is important to select content that displays bright images so as to ensure an impactful, memorable experience for your audience. One must remember that unless your stage show requires all house lights to be disabled, your content may have to compete with strobes and spot lights. You can use video editing software to help boost your content’s brightness and saturation but typically it comes at the cost of losing your crisper looking blacks. While it is important that your content be able to cut through atmospheric stage lighting and sometimes artificial fog, Volanti’s LCD displays produce a bright image right out of the box. Volanti’s modules ( video walls, individual panels ) come standard with a 500 to 800 Nit display range which compared to standard LCD displays that only produce a 300-400 Nit range, will provide a much brighter picture. Nevertheless it is still important to select content which will give you a greater range of brightness. Now that you have your content all laid out and ready to go, it’s now time to bring them to life using a variety of different VJ software tools. Most VJ software now comes with some sort of audio analyzer / editor which will allow your content to be visually effected / triggered by your audio source. Below is an example via DocOptic of how VJ software like Resolume allows you to custom control your visual effects and sync them to your audio source. Need help finding VJ software to control your video content? Here are a few of the more well-known programs that one may use. Depending on your interface preference and budget, you should be able to be up and running your live content in no time. GrandVJ is a real-time video mixer software that allows the user to compose up to 8 layers of video. 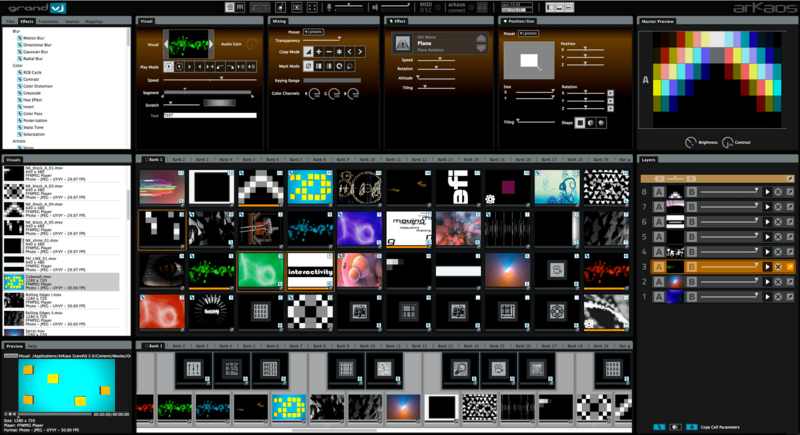 Compiled of a vast library of video effects, transitions and sound driven visual generators, this software will provide the user with everything he/she needs to put on an impactful live show. Click and drag any video from your hard drive, add effects to it and start making your own video show. GrandVJ allows the user to manipulate, trigger and mix video clips with sound, animated text strings or live cameras in much the same way as mixing music to create a spectacular audiovisual show. Resolume puts you in charge. You can play your videos when you want, how you want. Forwards, backwards, scratch and adjust tempo to the beat. 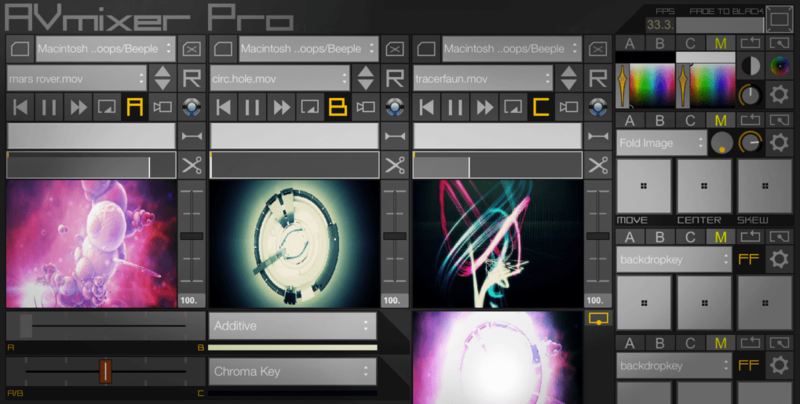 Mix and match your visuals quickly and easily and play Resolume like an instrument. 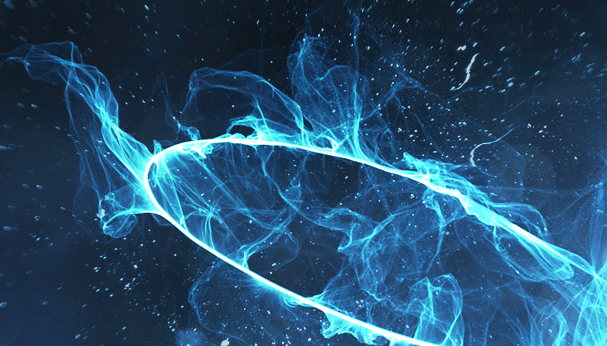 Whatever your style is, Resolume offers you an easy interface to rock it. Use as little or as many videos and effects as you like. The only limit is your computer’s raw power and your imagination. Apply effects, blend, mix, cut and edit, everything happens on the spot. 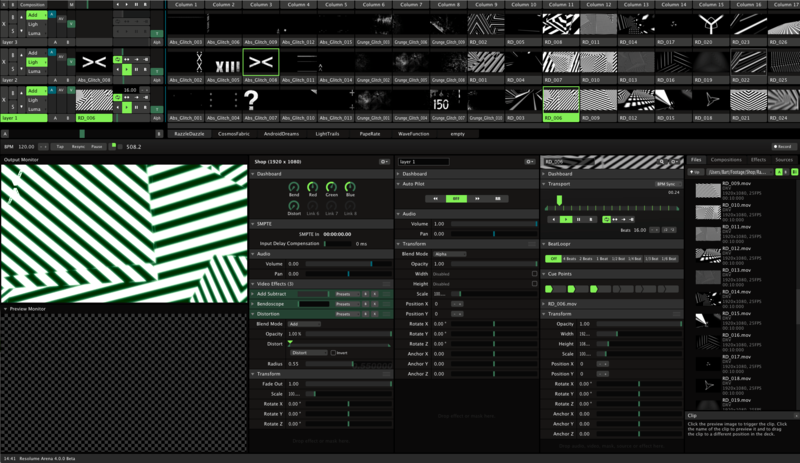 Resolume also plays your generative content made in Flash or Quartz Composer. Modul8 is software designed from A to Z for performance and real time video. It has been adopted by hundreds of users looking for a tool that is extremely responsive, flexible and easy-to-use. Used in domains as diverse as veejaying,contemporary art, live performances,theater and video production this software has proven its worthiness in hundreds of projects around the globe by an incredibly active user community. Modul8 can be controlled in many ways. The simplest and most accessible approach is by using the mouse and keyboard. For advanced use each function in modul8 can be assigned to a MIDI message that allows you to control Modul8 using any MIDI compliant device. Do you work with sound input? You can add audio intensity to any animation effect. By using the BPM module you can connect a rhythm to any function in modul8. Most importantly all of these functions can work together simultaneously.